As a new Lok Sabha ushers in in 2019, the Left parties may be down to single digits. Is Communism dead in India? The Left parties, especially the Communist Party of India-Marxist (CPI(M)) and the Communist Party of India (CPI) are now facing extinction in this Lok Sabha election. They were seen begging the Congress for an alliance in West Bengal and got rejected and all surveys predict no seats for the Communists, who ruled the state for more than 34 years continuously till mid-2011. In March 2018, CPI(M) saw a complete washout in Tripura and now the Left parties are seen only in Kerala. CPI-M on the back foot in Kerala? In Kerala, all poll surveys credit a maximum of five to six seats for the Left parties after Congress President Rahul Gandhi’s decision to contest from Wayanad, Kerala’s sure seat of Congress. Some surveys even predict two to three seats for the Left parties in Kerala, which currently has 20 seats in Lok Sabha. 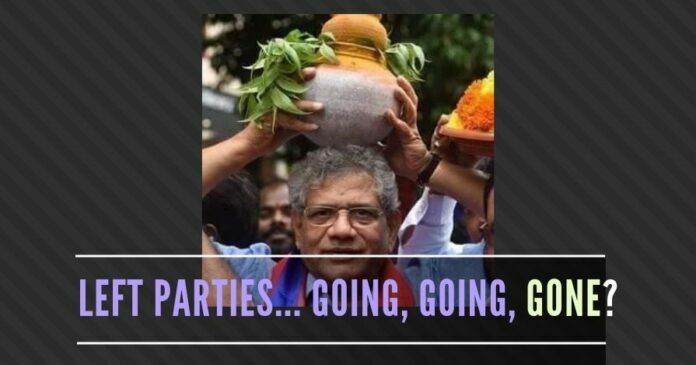 The irony is that the CPI(M) General Secretary Sitaram Yechury was considered as the go-between for all the non-BJP parties and was voluntarily offering his services to the Congress to create a big opposition alliance to check Bharatiya Janata Party (BJP)’s chances in the Lok Sabha election of 2019. He was running to all parties like the NCP, RJD, JD(S), DMK, SP, BSP,TDP, Kashmir’s National Conference and PDP and even to the sulking allies of BJP at one point. In the inner circles of Communists, Sitaram Yechury and CPI’s National Secretary D. Raja are considered as point-men for Congress in creating alliances with any party to prevent surging BJP. But both were royally ditched by all except the DMK, which graciously gave two seats each to CPI(M) and CPI in Tamil Nadu. RJD supremo and his younger son ditched the CPI by not giving a seat to Kanhaiya Kumar. In Bihar, RJD gave a seat only to ultra left CPI(ML) in their alliance. NCP supremo Sharad Pawar and JD(S) head Deve Gowda have shown the exit door to CPI(M) in Maharashtra and Karnataka respectively. CPI(M) was requesting for a single seat in the alliance in these states. The same thing happened to the Left parties from TDP head Chandrababu Naidu. All of a sudden, Yechury and Raja became untouchable or unelectable to these regional patriarchs, who were using the services of these two Communists for the past five years to attack the BJP and the Rashtriya Swayamsevak Sangh (RSS). The last blow was from Rahul Gandhi who landed in Wayanad (original name Vayal Nad or land of fields) and decided to contest against the CPI candidate. The presence of Rahul in the state has energized Congress and all surveys say that the Congress front is now expected to win a minimum of 13 seats out a total of 20 seats. At present, the CPI(M) is having nine MPs in Lok Sabha and CPI one. In the present state of affairs will the Left parties cross double digits in the forthcoming Lok Sabha? Next articleSEBI’s ignorance of happenings at MCX – Déjà vu? ZERO SEATS TO LEFT PARTIES WHOSE ONLY AGENDA IS DESTROY INDIA WITH TUKDE TUKDE GANG. Why did Nirmala Sitharaman approve the FIR?